If anyone ever needed any kind of convincing about the exceptional managerial qualities of Dr. Emmanuel Ibe Kachikwu, Nigeria's Minister of State for Petroleum, the events of the past few weeks provide eloquent testimonies. Yet, the honours have continued to come in torrents. First, it was the prestigious Burj CEO Award's "African Leadership Award of the Year", which was won in 2017 by His Excellency, Dr. Hage Geingob, President of the Republic of Namibia. This year, having been unanimously selected by the screening team of the annual award given by the renowned International CLUB of CEOs, Dr. Kachikwu was honoured with the prestigious "African Leadership Award of the Year", at an event held in Shenzhen Province, China, and attended by over 700 delegates from 32 countries. At the event, the State of South Carolina also declared October 25 as 'Emmanuel Kachikwu Day'.Members of the Black Caucus of the State Legislature, who hosted the event, paid glowing tributes to Dr. Kachikwu and made reference to his "unimpeachable" reputation for integrity, intelligence, fairness and kindness. But, not a man to embark on a needless ego trip, Dr. Kachikwu dedicated the awards to President Muhammadu Buhari. He said the awards came because the President gave him, who is from "outside the political mainstream", the opportunity to contribute his quota in trying to improve the country's oil and gas environment - an assignment in which he has acquitted himself creditably. To be clear, when Dr. Kachikwu came in as Minister of State for Petroleum and Group Managing Director of the Nigeria National Petroleum Corporation (NNPC) in 2015, the country's economy was facing many challenges - low crude production arising from militancy in the Niger Delta, crash in global oil prices resulting in depleted foreign reserves, loss of billion in oil revenue which deprived the country of resources to fund its budget and grow its economy, among others. In addition to the output cut, Nigeria, having provided a substantial justification to do so, was able to negotiate an exemption for itself and also secured extensions on two different occasions. This helped to stabilize the country's supply, income, and led to a significant growth in the country's foreign exchange reserves. That monumental increase was not accidental but clearly a product of right thinking, good initiative and hard work on the part of Dr. Kachikwu and many other managers of Nigeria's economy, and the fiscal astuteness of the President. In the fourth installation of his 8-Part Podcast Series focused on communicating the journey towards achieving the aspirations of the #7BigWins, Dr. Kachikwu explained that as a result of the government's shuttle diplomacy across member countries of OPEC, Nigeria, Iran and Libya were in 2016 granted exemption from a resolution by OPEC to cut oil output by about 740,000 barrels per day so as to improve the price of oil which had gone too low. That decision has since propelled oil prices from below $30 per barrel to around $82 per barrel. In the podcast produced in July and released on October 17, 2018 which focused on BIG WIN 7 - INTERNATIONAL ENERGY RELATIONS AND COORDINATION, Dr. Kachikwu shared what the government met on ground, showed the journey so far, and outlined the steps taken to deliver on the key components summarised in four main intervention areas: OPEC crude oil production cuts and Nigeria's exemption; African Petroleum Producers Organisation (APPO) reforms; explored opportunities in various bilateral relationships for the growth of Nigeria's oil and gas sector; and possible gains from rising global crude oil prices and how Nigeria is maximising the rally. The other reason for the growth in the foreign reserves, Dr. Kachikwu explained, was the relative peace that has returned to the country's oil-producing Niger Delta. "The effect of this is that it has stabilized supply and our income. Our budget was largely funded and we began to see our reserves, for the first time, grow dramatically from an all-time low of $25 billion to as high as $45 billion currently. This is about $20 billion movement in terms of reserves growth," Dr. Kachikwu said. "All these could not have been possible if we didn't solve the Niger Delta problem and if we didn't get an exemption from OPEC to continue to produce irrespective of the cost. And, of course, the effect of this was that the prices of crude jumped, it moved from $25 per barrel to about $75 per barrel," he said. In line with the Federal Government's drive for both indigenous and foreign investors to revamp dilapidated infrastructure in the country's oil and gas industry, Dr. Kachikwu embarked on strategic visits to International Oil Companies (IOCs) to galvanize support and mobilize funds for the industry. "As we move from a public sector-driven oil sector model, private sector financing is key. We need to be able to find investors who, on the basis of equity investments, can come in and massively change some of the dilapidated infrastructure that we see here and create a business model that makes sense for this country. 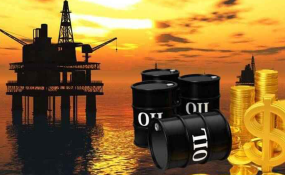 We will like to see production go up, at cost that makes a lot of sense," Dr. Kachikwu said. "One of the fallouts of this is the decision of the Nigerian LNG Limited now to take its 7th Train and, therefore, increase substantially the gas production in Nigeria, move Nigeria to about the second- or third-largest gas exporter in the world. That is a substantial move and it is a huge amount of investment and huge amount of investors' confidence in this country," Dr. Kachikwu said. While it is clear that there is still much ground to cover in Nigeria's determination to raise the status of its oil and gas industry to such a height where there would be massive local and international investment inflows and where the country would benefit optimally from this God-given resource for the good of its people, there is no doubt that so much has been achieved in this regard under Dr. Kachikwu's headship of the Ministry of Petroleum Resources. There is still room to do more.